One of the big challenges of freshwater natural history is that it is hard to determine what exact animals were present in rivers before modern collections began. Preservation of pristine freshwater environments has been almost impossible as anything upstream affects everything downstream. 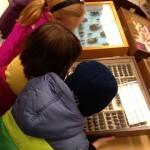 Our zoological museums are a physical catalogue of the historical wildlife in an area and a guide for where our habitat reconstruction goals should be set. Physical collections are fragile. 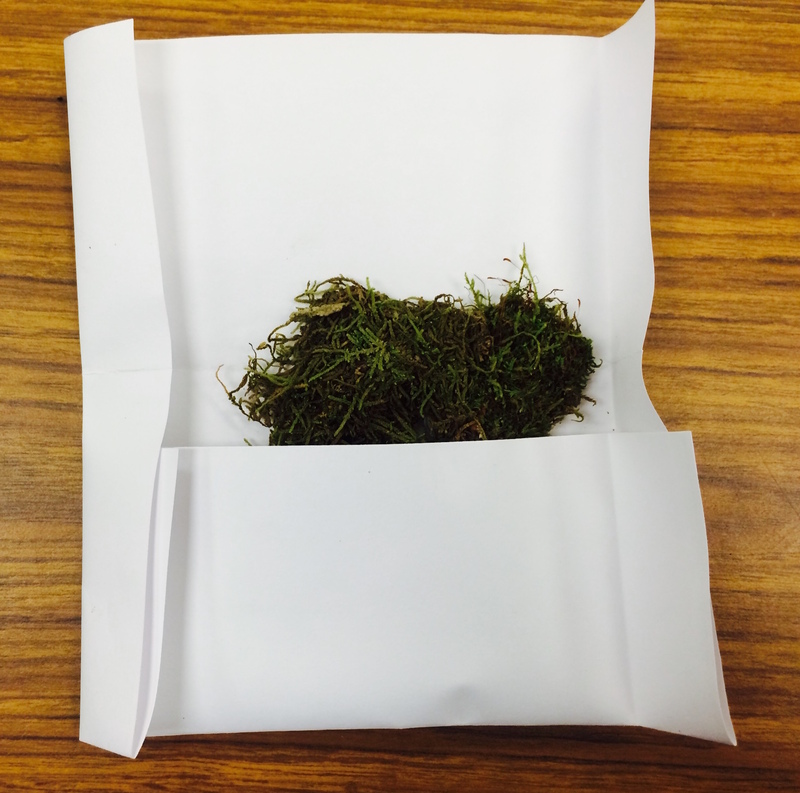 It’s easy to lose data somewhere along the line and have the specimens themselves become nothing more than physical curiosities. It’s even easier to have an extensive and meticulous collection fall into the hands of disinterested heirs and be lost to us. 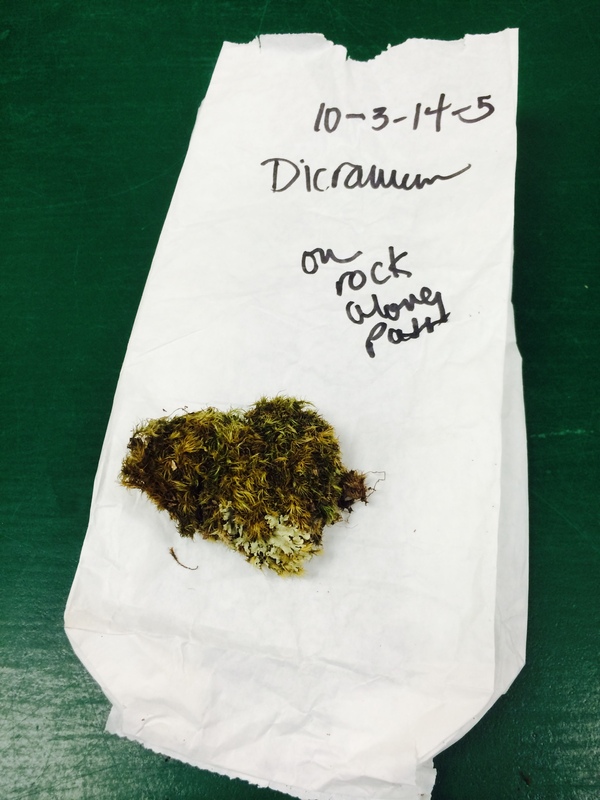 Specimens need to be cared for properly to maintain their quality, and the longer it has been since they were collected, the less likely it is that the historical value is maintained. 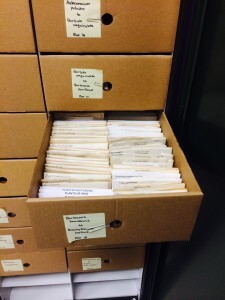 Occasionally these collections are saved via thoughtful preservation by some concerned individual or institution or, much less often, by a fortuitous fluke of storage through a period when, had it been accessible, it might well have been destroyed. A collection of old labels, now dissociated from their original specimen. 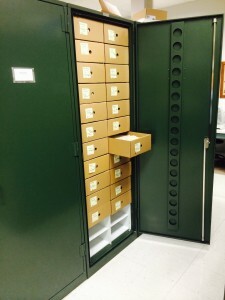 A perfect example of this kind of fortuitous preservation is represented by two collections, The Hildreth and Holden Collections, currently located in our Bivalve Collection. 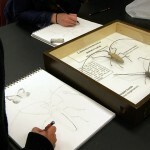 These two collections were discovered together at Marietta College, Ohio. 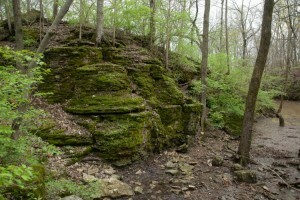 Few details exist today regarding the exact discovery, but some information has been preserved. Everyone directly involved with the discovery has, as far as I can tell, passed away long ago without publishing the details of the find. It’s a weird twisting tale and, I believe, it deserves to be informally recorded here. Although Ohio has some 180 freshwater fish species living in the State’s lakes and streams, it is home to only one endemic species: the Scioto Madtom, Noturus trautmani. In November of 1943, when OSU Museum of Zoology Curator Milton Trautman captured the little catfish from his favorite locality, he recognized that it was not a form that he’d encountered during his multitudinous collecting trips. These fish, which were later described and named in his honor, are similar to the Elegant Madtom, Noturus elegans. 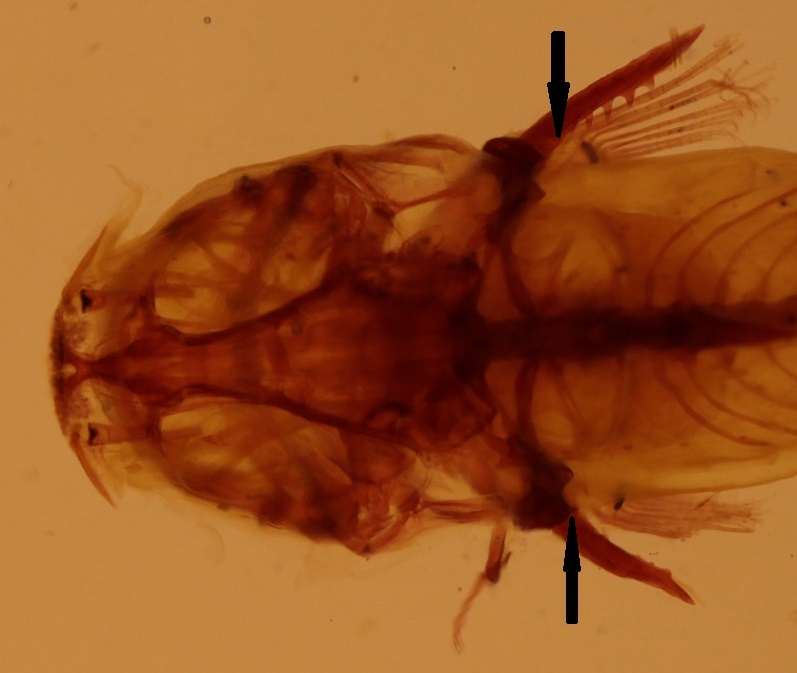 A study carried out by W. Ralph Taylor (1969) recognized those similarities in describing the Scioto Madtom and placing it close to the Elegant Madtom phylogenetically (substantiated in a 2009 publication by Egge and Simons), although osteologically the two are quite different. 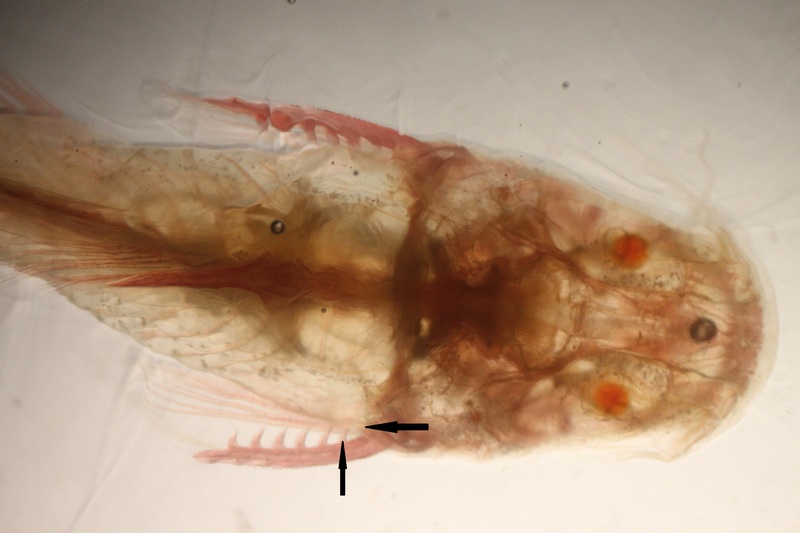 Icthyologists postulate that the Scioto Madtom may have speciated from an elegans population following a glaciation event. 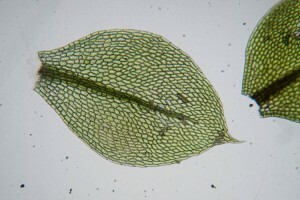 OSUM 9575 – Noturus trautmani – Cleared and Stained preparation. 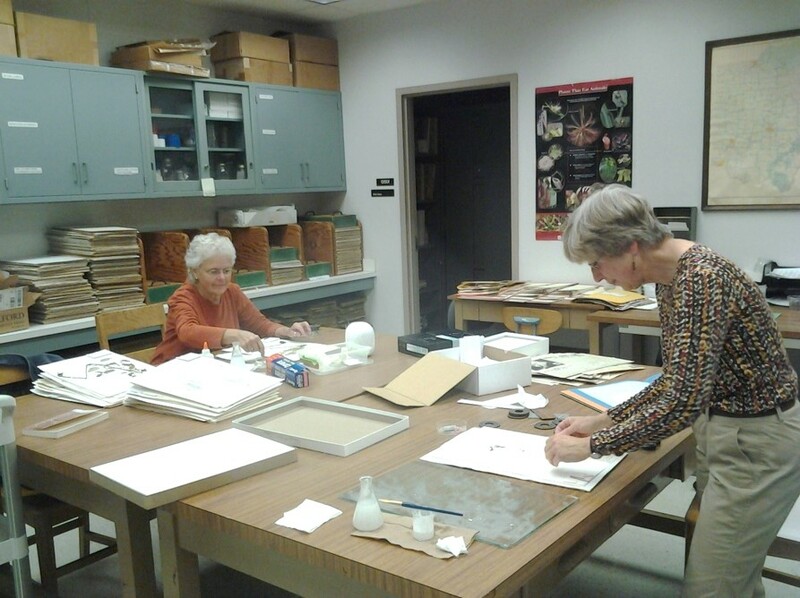 OSUM 18913 – Noturus elegans – Cleared and Stained preparation. Although anatomical features and a unique color pattern were used to justify recognizing the Scioto madtom as a distinct species, several local fish enthusiasts have wondered whether the Scioto Madtom population were simply hybrids between the Stonecat Madtom Noturus flavus, which resembles the Scioto Madtom in coloration and in possessing a low adipose fin, and Noturus stigmosus, which has long pectoral barbs and humeral processes but strong saddle markings on its body. However, no instance of hybridization between these species has been reported, although other hybridizations are reported among madtoms. The length of Big Darby Creek from which Milton captured almost all of what was later called the Scioto Madtom are recorded in our catalog book as 100-200’ above the State Route 104 bridge. The first Scioto Madtom specimens collected were found in Riffle No. 3 of a series of four riffles and runs called “Trautman’s Riffle”. 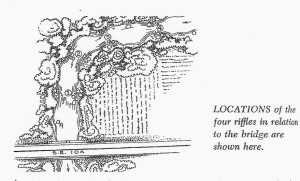 Drawing of Trautman’s Riffle from Gilfillan, Merrill C. 1963. The Fishes of Trautman’s Riffle. 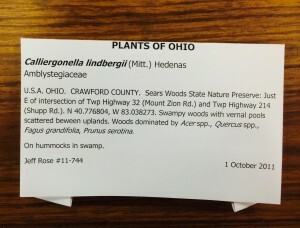 Ohio Conservation Bulletin, Vol. 27, No. 5. pp. 22-24. Trautman’s Riffle on Big Darby Creek upstream of State Route 104. Photo by Anthony Sasson of The Nature Conservancy. 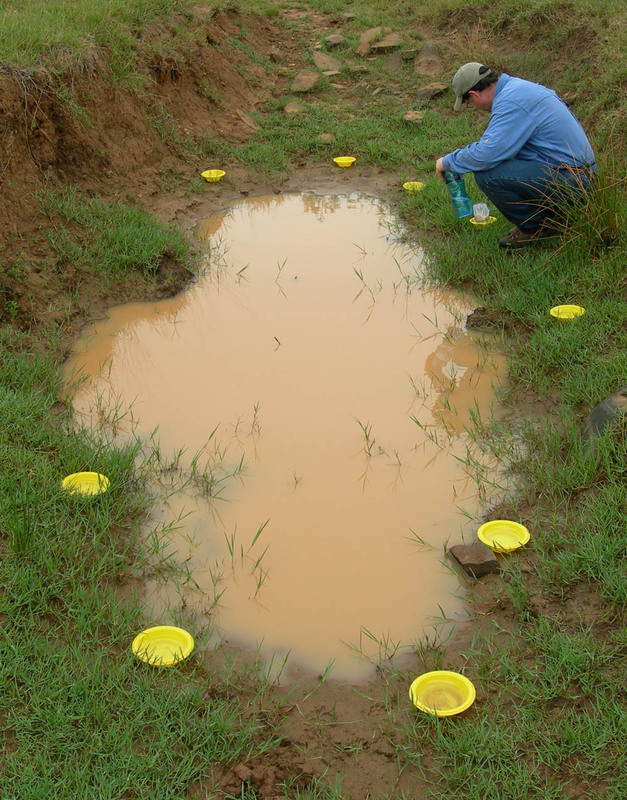 Trautman and his successor in the OSUM Fish division, Ted Cavender, both searched extensively for populations of Scioto Madtoms outside of the type locality. 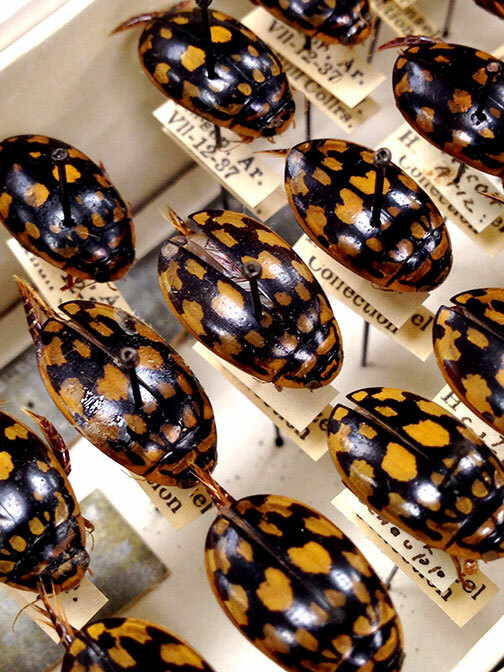 These collections led to the discovery of other species of madtoms, but failed to unearth another population of Scioto Madtoms (the last one collected was in Autumn of 1957). My introduction to Trautman’s Riffle didn’t happen until the mid-1990’s. 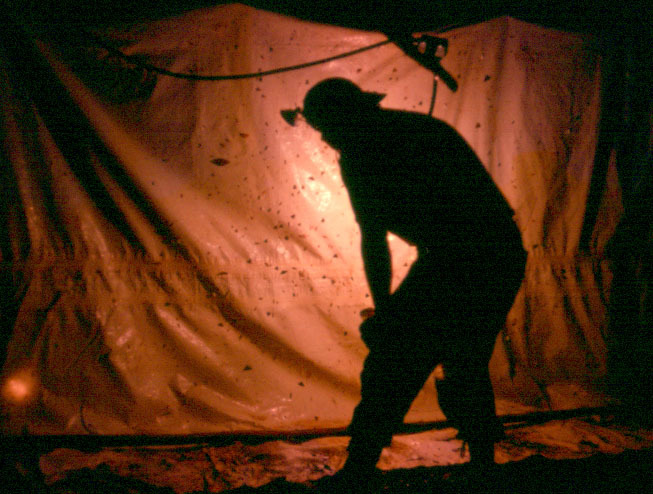 Although I’d spent many a day on lakes, reservoirs and rivers fishing with my grandfathers, my fishing experiences had not included seining until I took Ichthyology at OSU with Ted Cavender. 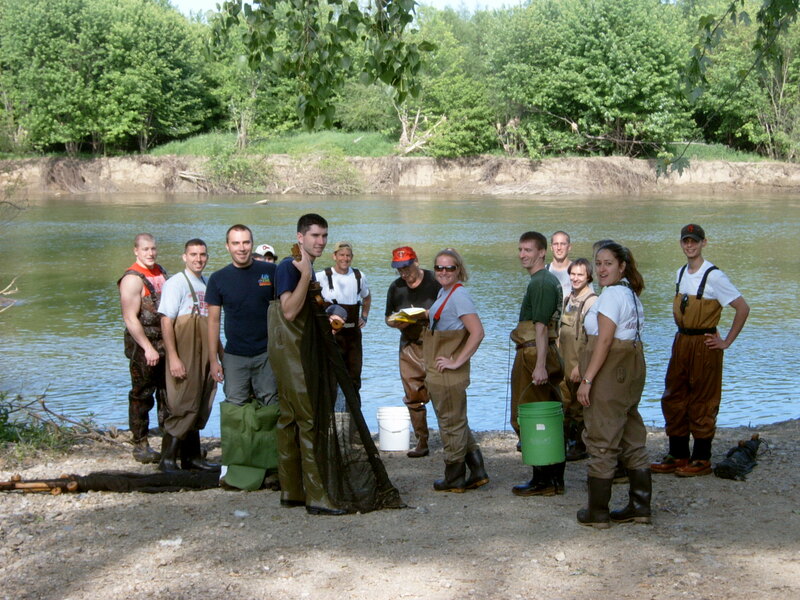 Ted Cavender (center), OSUM Curator 1970-2005, with his OSU Biology of Fishes class at the Scioto River fishing access just east of the Big Darby Creek confluence, ca. 2002. 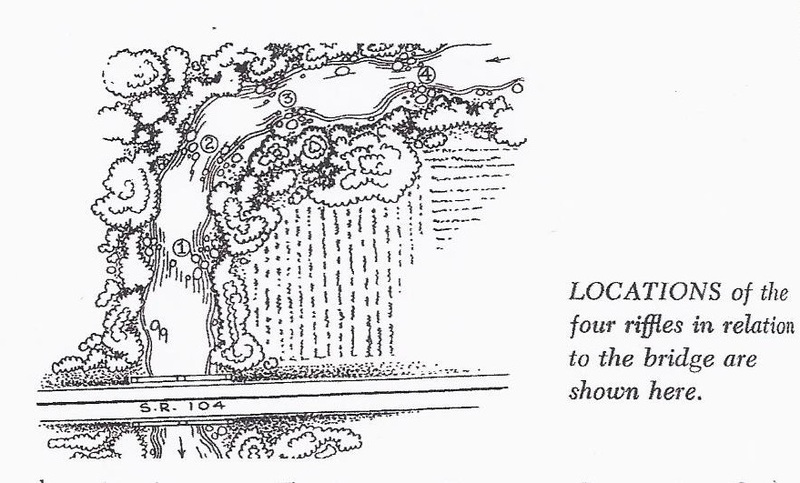 In the 20 years since this introduction, I have personally observed some of the riffles in the vicinity of Trautman’s Riffle moving, due to the “flashy” flooding character of the stream. One such riffle downstream from Trautman’s Riffle headed up under the State Route 104 bridge to about 50 yards downstream, and some of the structure appears to have moved down to an area at the next major bend in the stream’s course. Despite the dynamism of the Big Darby in this stretch, Trautman’s Riffle remains mostly intact, although it seems to have been better defined when Milton collected the Scioto Madtom back in the 1940’s and 1950’s. 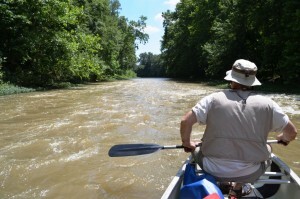 The increased propensity for flooding and the increased impact of these floods in Big Darby Creek is due at least in part to anthropogenic changes to the topography of the watershed as well as to its hydrology. Clearing of the riparian area right up to the edge of the creek removes the trees, brush and grasses that serve as a natural filter for pollutants like smothering silt loads from farm field tillage and removes tree roots that hold the upper layer of dirt and enable the stream to create undercut areas where fish hide. A natural riparian buffer also furnishes woody debris that falls into the stream, creating more habitat and egg laying areas for fish. 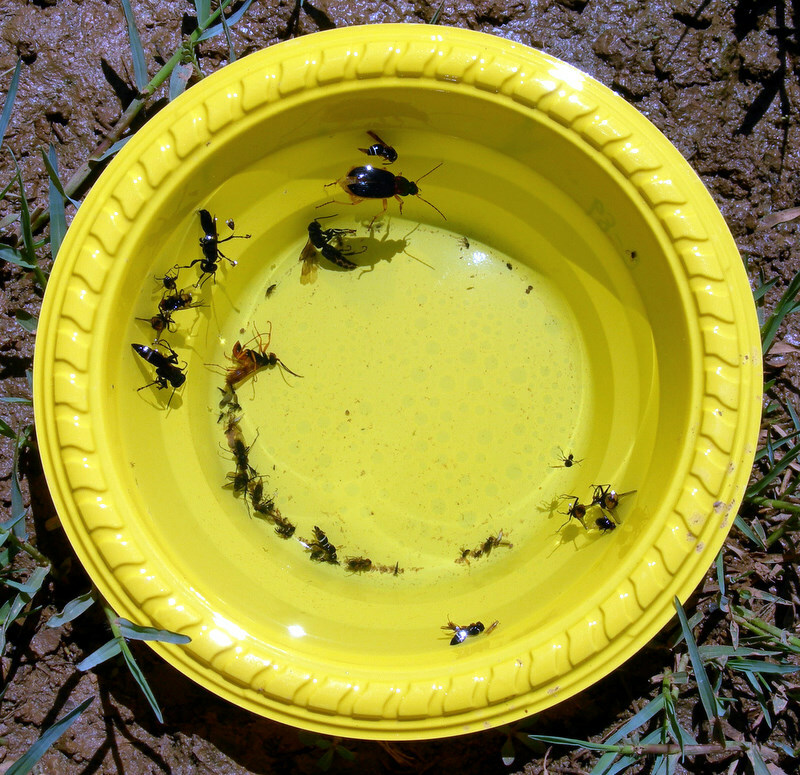 Could a flooding event, other weather conditions, or impacts such as siltation of substrates from agricultural tillage, have affected the Scioto Madtom population severely enough that they were unable to propagate? A catastrophic release of silage on Little Darby Creek in the 1980’s wiped out an otherwise healthy population of Least brook lampreys at Mechanicsburg Ohio, demonstrating the potential impact of a rare event. Since the Scioto Madtom was only ever found in a very small population, and subsequently not found for many years, the species was listed for decades as an endangered species. Several governmental and private monitoring agencies have sampled the site and conducted exhaustive sampling of other localities in the Scioto River and other major Ohio River tributaries, especially those that focused exclusively on habitats where Madtoms could be expected. One such effort was funded by the U.S. Fish and Wildlife Service. 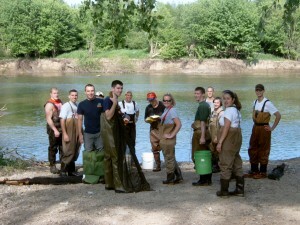 The 3-year project to sample the major Ohio River tributaries within the state for Madtoms turned up nets full of Northern Madtoms, Mountain Madtoms and Stonecat Madtoms, but unfortunately no Scioto Madtoms. Because of the lack of results despite intensive expert searches, many suspected it was extinct. The U.S. Fish and Wildlife Service and the Ohio Division of Wildlife concur, and have recently declared the Scioto Madtom extinct. This new listing notwithstanding, we can’t help but keep an eye out every time we are in suitable habitat for the elusive, endemic, endangered Scioto Madtom. About the Author: Marc Kibbey is Assistant Curator of the OSU Fish Division at the Museum of Biological Diversity. 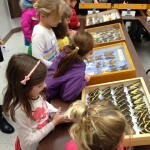 We frequently give tours of the Triplehorn Insect Collection to school groups, families, etc. 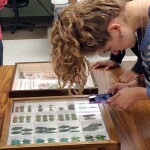 Since most entomologists like to talk about their insects, that’s usually a fun time for me. 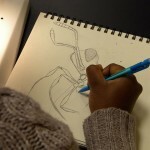 It is also a great time to flex my General Entomology muscles. 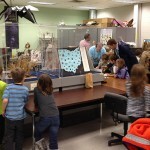 Visitors ask lots of questions, some of them interesting (How many ants are there in an ant’s nest? Do young cicadas sing underground? 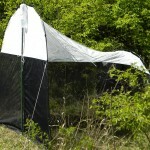 ), some funny (Do you eat bugs every day? ), some actually very difficult to answer (How many bugs are there in the world right now, how much do they weigh, and how do you know? How come you don’t have a list of all insect species in the world?). 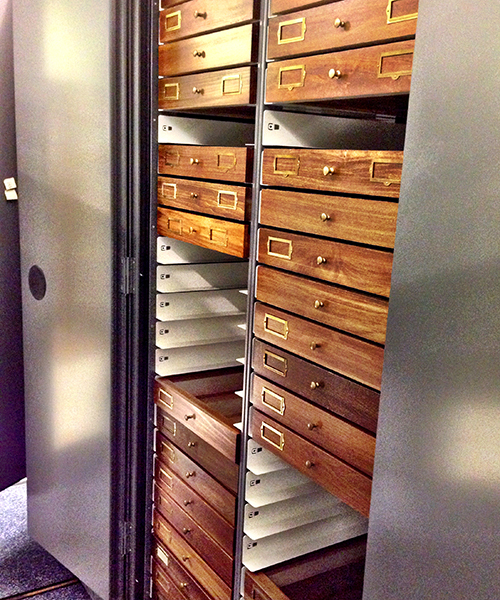 Open collection cabinet showing insect drawers. 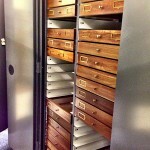 During a recent tour of the collection, after my brief intro on the history and structure of the collection, an 8-year old visitor asked me point blank: ‘If all the bugs in the collection are dead & put away in their little boxes, what do you do the whole day?’ Somebody behind me gasped, but I thought that was a good question, especially as I had just told them that we keep our specimens in cabinets, safe from humidity, light, and especially other bugs that might want to try and eat the dead specimens. So I told them that, yes, we keep the insects safe in cabinets, but that’s when they are not being used. And use them we do, a lot! Where can you find this (species of) wasp? 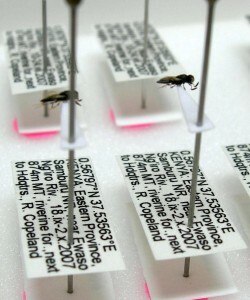 – museum specimens have labels attached to them that contain locality information. The geographic coordinates for the locality can be plotted on a map like the one below. Data for multiple specimens of a species help us understand the geographic distribution of the species. 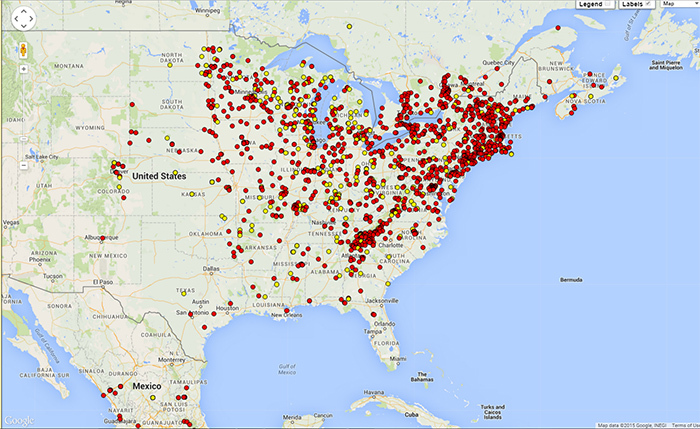 Specimen records plotted on a map show the skewed distribution of Pelecinus polyturator, a parasitoid wasp, in North America. 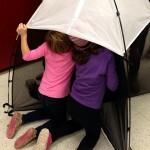 When is the best time of the year to find that wasp? 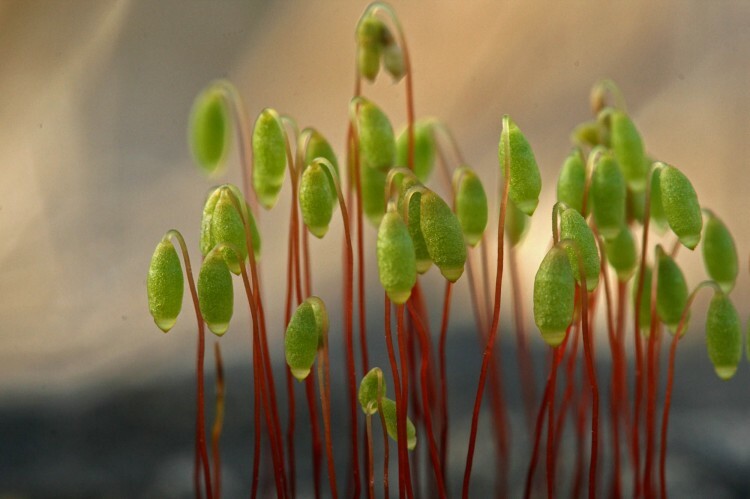 – specimen labels may contain a date of collection, which then may help pin-point the time of the year the species can be found in a specific place. 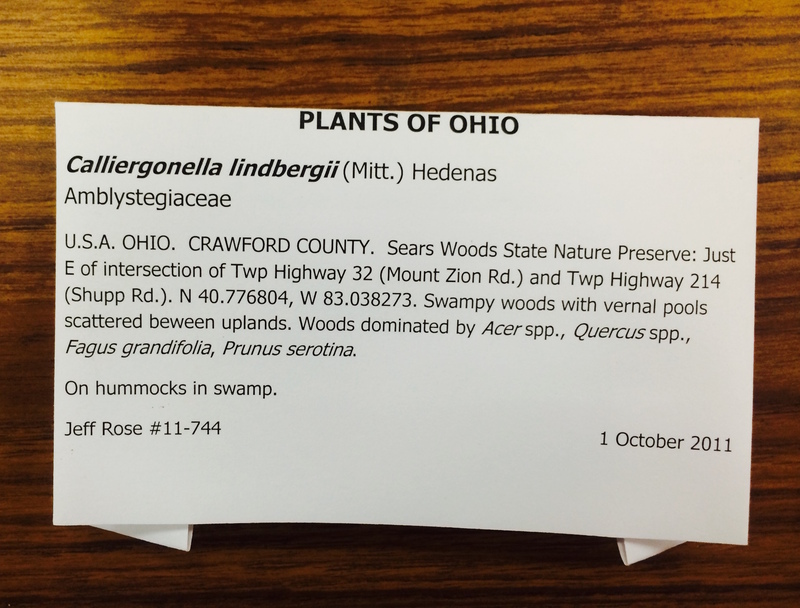 This label provides both detailed locality data and biological information (host species) as well. Label including geographic coordinates, altitude, type of trap, and habitat. 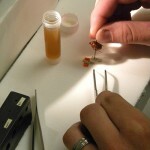 With locality and date of collection alone we can already learn a tremendous amount about that species of wasp. For some areas, we can look up weather reports from that exact day and see if it was raining that day, what the average, the maximum and minimum temperatures were, also the barometric pressure, and other environmental factors that may (or may not) affect the species. 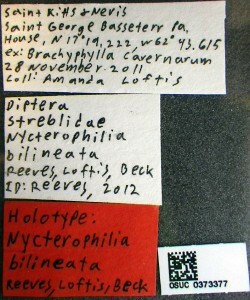 Labels may provide information on the way the specimen was collected (examples: by hand at light; using traps like a Malaise (below, middle), or yellow pans (below, right)), and the kind of vegetation (forest, grassland, prairie, etc.) 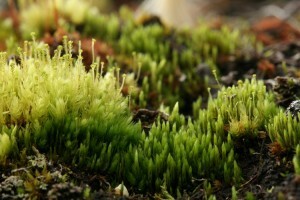 encountered in the area it was collected. Sometimes labels also include information on what the specimen was feeding on, burrowing in, coming out of, what other species it was associated with, and more. 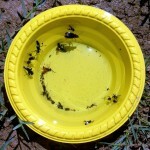 It is quite amazing how much valuable information insect collectors manage to squeeze onto a tiny piece of paper! The label information found on museum specimens is extremely valuable data for scientists trying to learn about a species and to start assessing the impact of environmental changes on living organisms. 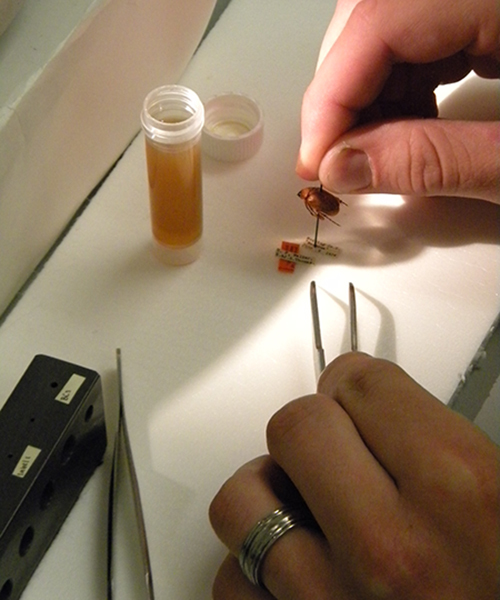 Now, back to the young visitor’s question: ‘What do we do the whole day?’ One of the major responsibilities of a curator (= caretaker) is to make specimens and specimen data available for scientific study. 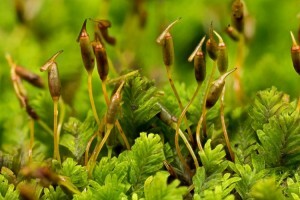 That can be done either by carefully packaging and sending the specimens on loan to a scientist, or, more recently, by databasing the specimen information and making it available online to the scientific community and the general public. 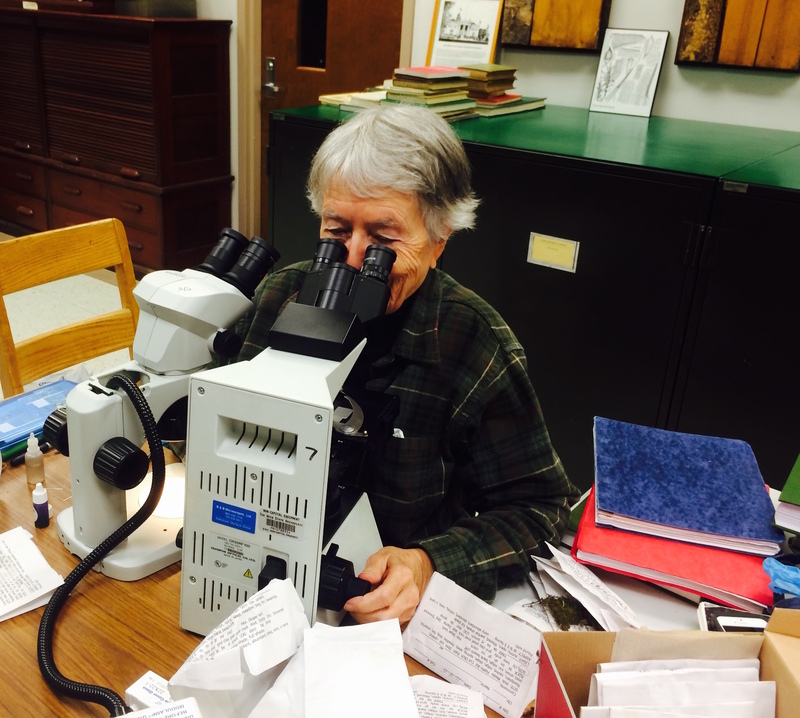 Either way, that involves a lot of work, particularly in a large — we hold about 4 million dry specimens — and, relatively old — we just turned 80 in 2014 — collection like the Triplehorn. It is not uncommon for us to loan 3,000 specimens to one scientist. The largest loan we sent out to date contained 28,000 specimens – we worked on the preparation of that loan for months! 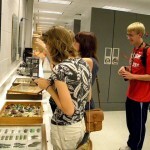 We also welcome scientists who want to come on research visits to the collection. So, just making the specimens and the specimen data available to the scientists is a lot of work. We could stop right there and we would still be very busy every day of the week. But we don’t stop there, oh no! The collection keeps growing in various ways. 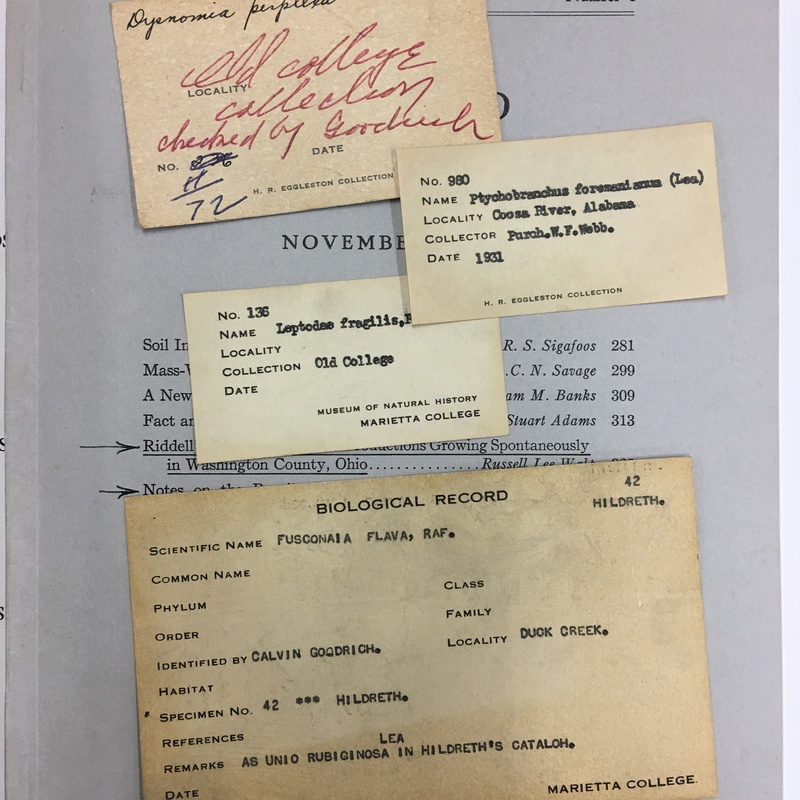 Scientists deposit voucher specimens of their research with us — that’s actually one of our main missions, to house and preserve vouchers of scientific studies so other scientists can examine those specimens if and when they need to. Private insect collectors also donate their collections to us — just last month we were presented with the late Steve Sommer Collection of butterflies and moths from Ohio and the Midwest, about 1,000 specimens. These new arrivals are placed in a -40°C freezer for several days to kill any potential pests that might be infesting the specimens. Next they are examined for damage, and even sometimes fixed — broken parts are glued to a card or put away into tiny vials or gel caps. After this basic upkeep work is done, we add the specimen data into our database — sounds simple, but there are many steps to that operation, and, you guessed, a lot of work involved. 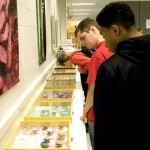 Finally, we add the specimens to the main collection. 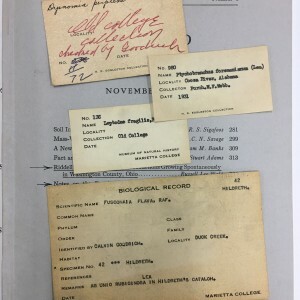 I won’t get into details of the curatorial or the databasing work here, but in case you are interested, you can read about it in the collection’s blog, the Pinning Block, and follow our posts on our Facebook page. Oh, and did I mention we collect? 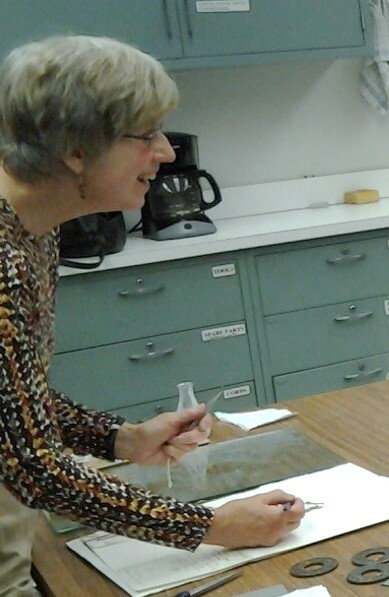 Yes, we collect new specimens for our own research (in my case, and Dr. Johnson’s, it is parasitoid wasps), or to fill in the gaps we have in the collection. That’s a big source of growth and (guessed righ again?) more work! 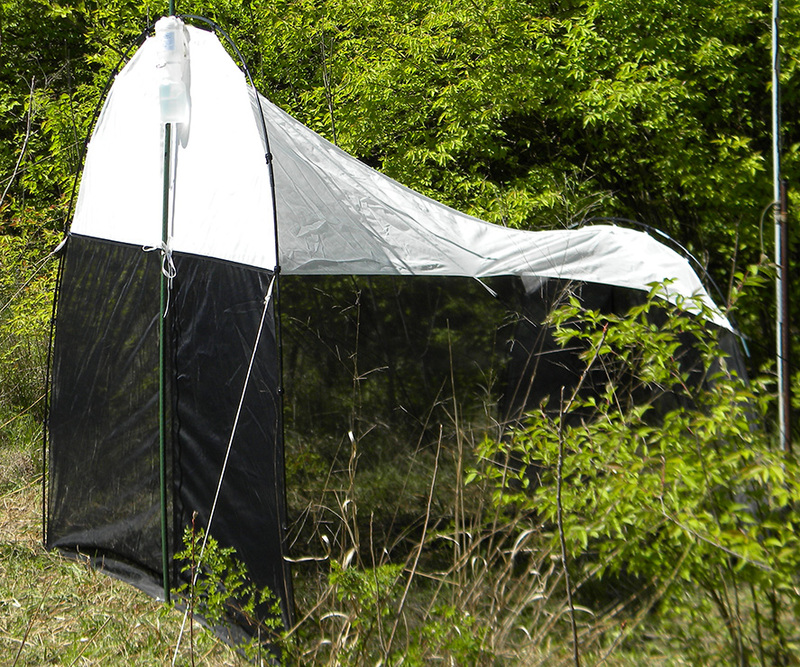 Dr. Norman Johnson, Director of the Triplehorn Insect Collection, collecting parasitoid wasps in South Africa. 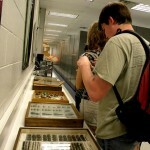 Newly collected specimens are always being prepared, dried, mounted, labeled, databased, and added to the collection. These specimens will one day be studied by scientists and maybe even be described into a new species. 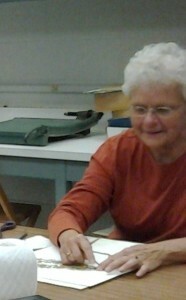 In the meantime it is up to the curatorial staff of the collection to keep them safe and accessible. And that’s an entirely new post. Keep tuned! About the Author: Dr. Luciana Musetti is the Curator of the Triplehorn Insect Collection at Ohio State University. All photos are courtesy of the author. Thanks to Norman Johnson & Gisele de Souza da Silva for careful review and thoughtful suggestions.